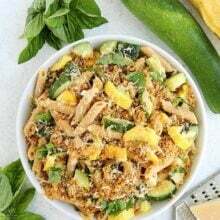 Zucchini Parmesan Pasta with fresh basil and brown butter bread crumb topping is a great pasta recipe for using up the garden zucchini. Everyone loves this easy weeknight pasta! Pasta nights are always happy nights at our house. 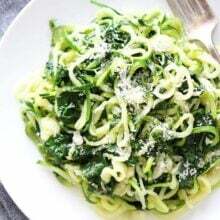 Our entire family loves a good pasta dinner and we are currently loving this Zucchini Parmesan Pasta. I have been making it on repeat because our garden is producing massive amounts of zucchini and yellow squash right now. I love making zucchini bread and zucchini cake, but I also love going the savory route with pasta! You can’t beat a big bowl of pasta for dinner, especially when this Zucchini Parmesan Pasta is on the menu. You guys are going to LOVE this one. It is the perfect pasta recipe to use up all of your garden squash and the brown butter breadcrumb topping will blow your mind!! It is a game changer. 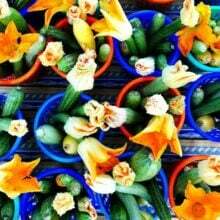 At the end of the summer, we always have lots of zucchini and yellow squash from our garden. I am always looking for new ways to use it up and pasta is always a good idea. 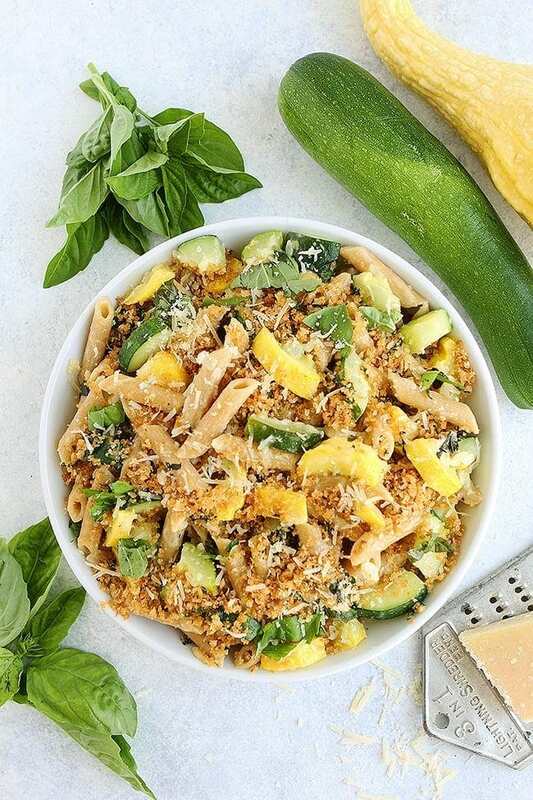 We always keep our pantry stocked with DeLallo pasta so I used our favorite pasta and our garden squash to make zucchini parmesan pasta, which is a family favorite! 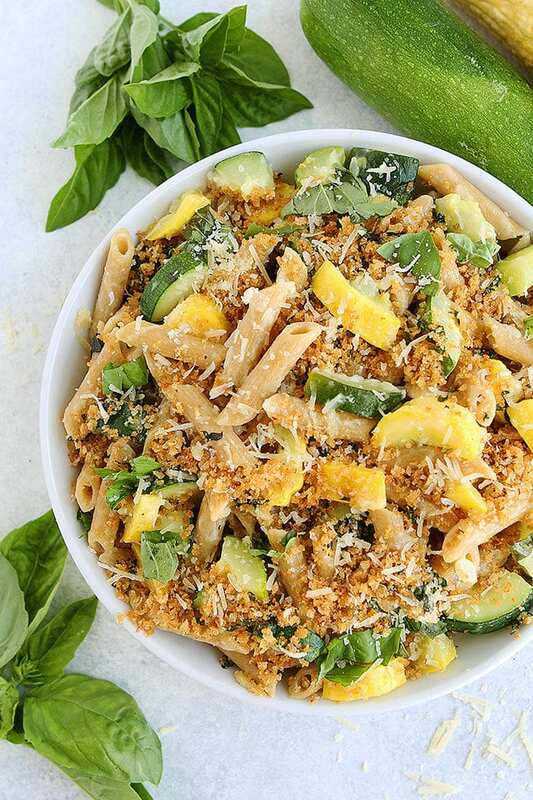 This easy pasta dish is loaded with zucchini and yellow squash. 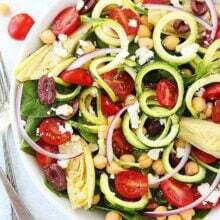 If you only have zucchini, you can use all zucchini and same with the yellow squash, I just like the mix in this dish because I love the green and yellow colors. I make the brown butter breadcrumbs first. I like to brown butter in a light skillet so you can tell when the butter is browning. You want to add the breadcrumbs as soon as the butter starts to turn brown. The butter will continue browning as you toast the breadcrumbs. Make sure you stir the breadcrumbs frequently so they don’t get too toasted. Set the breadcrumbs aside until the pasta is done. For the pasta, we like to use DeLallo Organic Whole Wheat pasta, it is our favorite. For this recipe, you can use penne, farfalle, fusilli, orecchiette, spaghetti…whatever you like! Really any pasta will work, use what you have on hand. Cook the pasta according to package instructions and make sure you reserve 1/2 cup pasta water. Don’t forget this step. You will use the pasta water to add to the pasta and vegetables. It will help create a sauce with the butter and Parmesan cheese. Make sure you use a large, deep skillet to cook the squash because you will be stirring the pasta in after it is done cooking. Top the pasta dish with the brown butter breadcrumbs before serving. You don’t have to use them all, sprinkle on the amount you desire. You can always save the rest for leftovers or for another pasta dish. 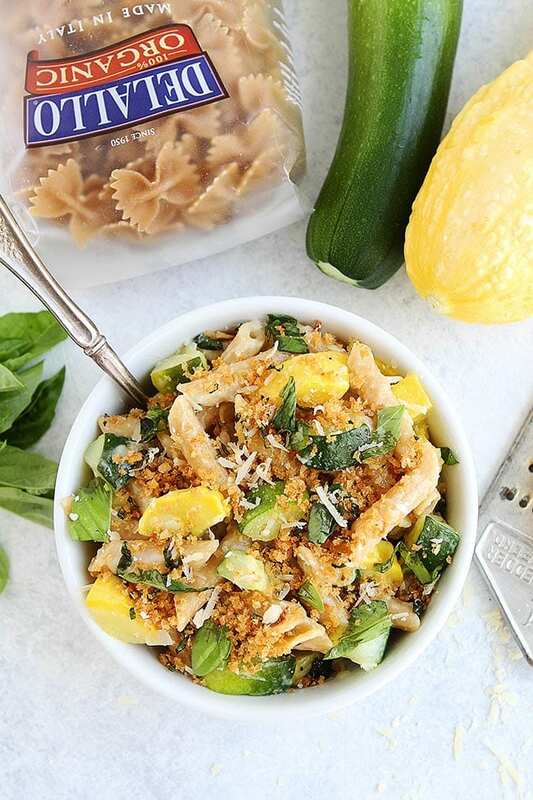 Enjoy the end of summer with this Zucchini Parmesan Pasta! It is perfect for an easy weeknight meal. You can’t go wrong with pasta, it is always a dinner winner! 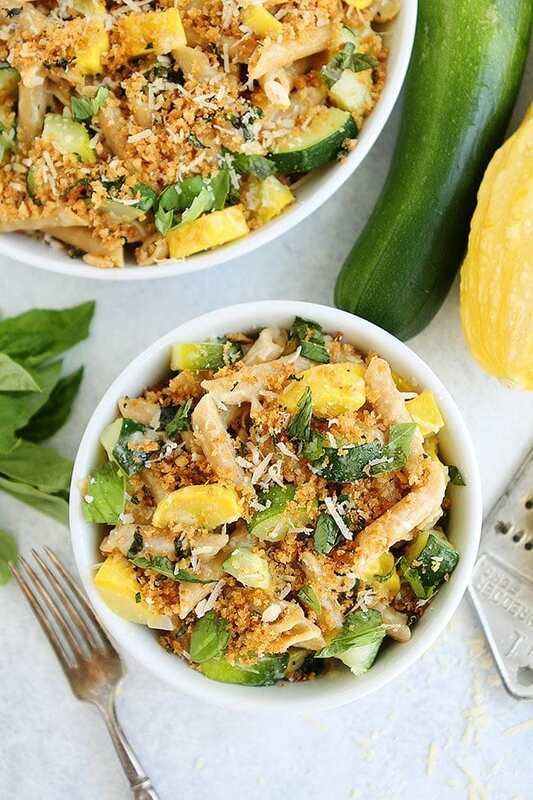 Zucchini Parmesan Pasta with basil and brown butter breadcrumbs is the perfect summer pasta dish! Great for an easy weeknight dinner! For the Brown Butter Breadcrumbs: Melt the butter in a medium skillet over medium heat and continue to cook, until the butter turns light brown in color. You will want to stir the butter occasionally as it is browning. As soon as it starts to smell nutty and is light golden brown, add in the breadcrumbs and garlic. Don't let it get too brown or it will burn. The butter will keep cooking as you toast the breadcrumbs. Stir until the breadcrumbs are moist with the butter. Add in the basil, lemon zest, and salt. Keep stirring and cooking until the breadcrumbs are toasted and golden brown in color. Set aside. For the Pasta: Bring a large pot of salted water to a boil and cook the pasta according to package instructions. Make sure you reserve a 1/2 cup of the pasta water before draining. While the pasta is cooking, heat the olive oil in a large skillet over medium-high heat. Add the zucchini and yellow squash and cook for 5 minutes, stirring occasionally. Add in the shallot, garlic, and crushed red pepper flakes. Cook until the vegetables are tender, but not mushy, about 3 more minutes. Stir in the cooked pasta. Add in about 1/4 cup of the reserved pasta water and let simmer for 1 minute. Add in the butter and Parmesan cheese and stir until melted. Add the fresh basil, lemon juice, and season with salt, to taste. If the pasta seems dry, you can add in a little more pasta water and stir. 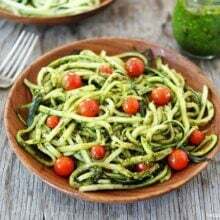 Place the Zucchini Parmesan Pasta in a large serving bowl or individual bowls. Top with the brown butter breadcrumbs and additional Parmesan cheese, if desired and serve immediately. thank you for this recipe, a nice change for me at least, and I always go with whole wheat pasta too, try not to have too much either, but love to eat it when I do, especially when it’s paired with new flavors to me, so much appreciated! The zucchini, the brown butter breadcrumbs, the pasta…this dish just keeps getting better and better!